Haematemesis is simply defined as “vomiting blood”. It is caused by bleeding from part of the upper portion of the gastrointestinal tract. It has a wide range of possible causes, depending on the site of blood loss and the tissue that is actively bleeding. Indeed, patients with haematemesis can present in a number of clinical states. In this article, we shall look at the causes, investigations and management of haematemesis. 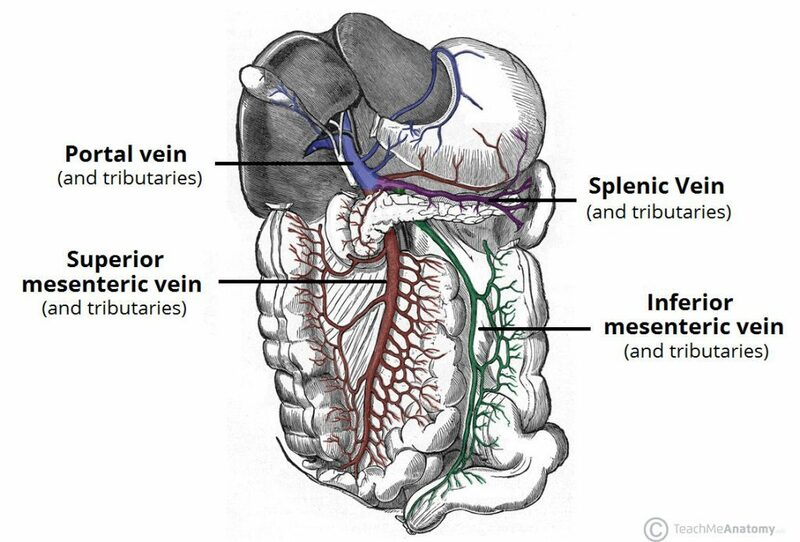 Oesophageal varices refer to dilations of the porto-systemic venous anastomoses in the oesophagus. These dilated veins are swollen, thin-walled and hence prone to rupture, with the potential to cause a catastrophic haemorrhage (Fig 2A). The most common underlying cause for oesophageal varices is portal hypertension resulting from alcoholic liver disease. Any haematemesis in a patient with known history of alcohol abuse should be investigated with an urgent OGD. Gastric ulceration is responsible for about 60% of haematemesis cases. Ulceration can result in erosion into the blood vessels supplying the upper GI tract (most commonly on the lesser curve of the stomach (20%) or posterior duodenum (40%)) and can result in significant haemorrhage. Patients may present with known active ulcer disease / H. Pylori positive, a history of NSAID or steroid use, or previous epigastric symptoms suggesting peptic ulceration, all of which may aid your initial assessment and diagnosis. A Mallory-Weiss tear is a relatively common phenomenon, typified by episodes of severe or recurrent vomiting, then followed by minor haematemesis. Such forceful vomiting causes a tear in the epithelial lining of the oesophagus, resulting in a small bleed. Most cases are benign and will resolve spontaneously, therefore providing the patient reassurance and monitoring is usually all that is required. Any prolonged or worsening haematemesis warrants investigation with an OGD. Oesophagitis is a condition that describes inflammation of the intraluminal epithelial layer of the oesophagus, most often due to either gastric acid reflux (GORD) or less commonly from infections (typically Candida Albicans, Fig 2B), medication (such as bisphosphonates), radiotherapy, ingestions of toxic substances, or Crohn’s disease. Any acute bleed may not initially show an anaemia in the FBC, whereas LFTs may reveal underlying liver damage as a potential cause. All patients with haematemesis should have a Group and Save; those with significant haematemesis (especially suspected variceal bleed) should have at least 4 units of blood cross-matched. The definitive investigation in most cases of haematemesis is via an oesophagogastroduodenoscopy (OGD), which also forms part of the management in cases of ongoing unstable bleeding. This should be performed within 12hrs in most cases of acute haematemesis or as soon as possible if the patient is unstable. An erect CXR (Fig. 3) may also be required if a perforated peptic ulcer is suspected as the underlying cause. 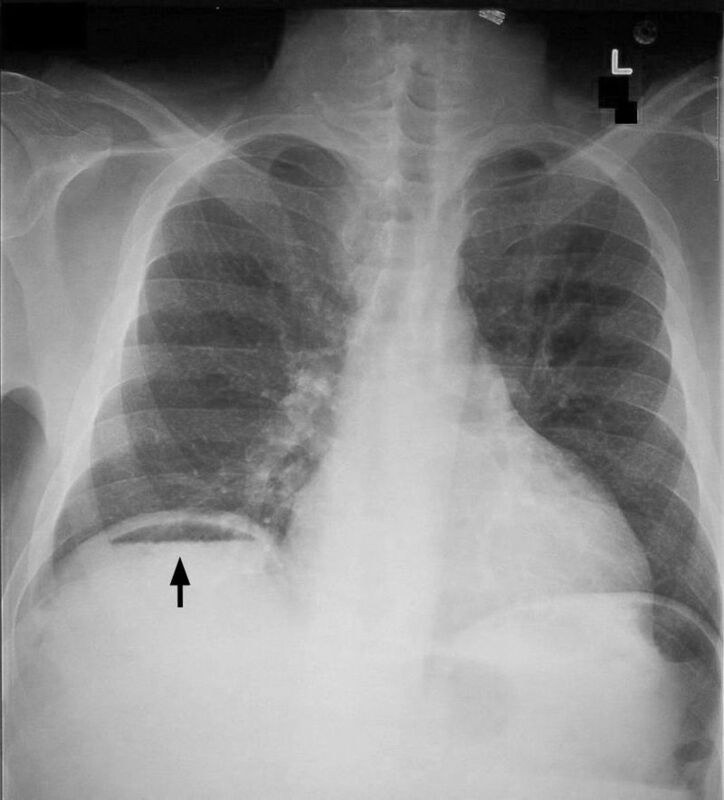 In such a case, air may be visible underneath the diaphragm (pneumoperitoneum). The Glasgow-Blatchford bleeding score (GBS) is a scoring system used to risk stratify patients admitted with an upper GI bleed, based purely on clinical and biochemical parameters. This allows for appropriate management of further investigations, especially as the score can be calculated prior to any OGD. Patients with haematemesis can be extremely unstable. The first step in their management is a rapid ABCDE assessment, to insert two large bore IV cannulas, start IV fluid resuscitation if needed and send blood for group & save / X-match. An actively bleeding patient can also be treated with angio-embolisation, in which the bleeding vessel is embolised. This is most commonly the gastro-duodenal artery which is eroded into by an ulcer at the back of the first part of the duodenum. Which of the following is the correct description of Mallory-Weiss syndrome? Which x-ray sign may indicate a perforated gastric ulcer? Which of the following is NOT a part of the Rockall Risk Score? 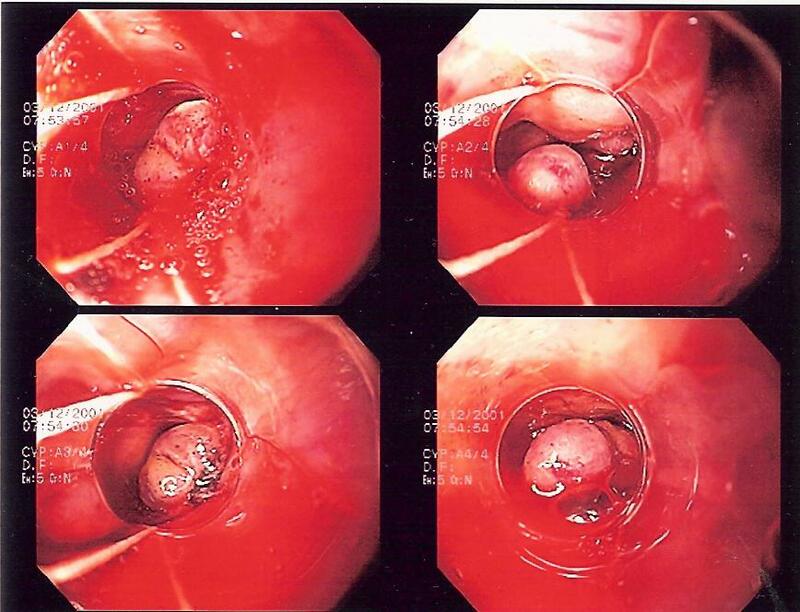 Which of the following is an endoscopic therapy used to treat oesophageal varices?